IT was a very special weekend for one west Sligo resident. Bridget Dunphy turned a century old on Saturday and was surrounded by friends and family to celebrate the milestone. 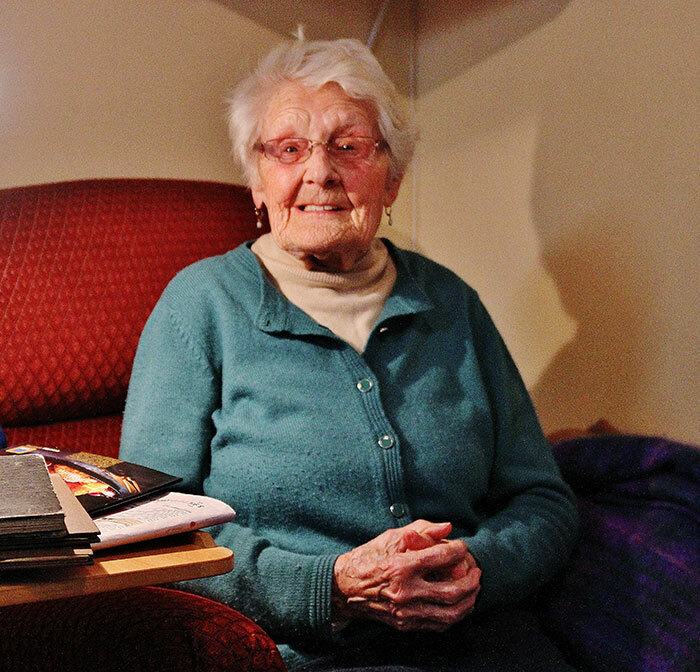 Shortly before her party, Bridget, or Bea as she is more commonly known, spoke to the Sligo Weekender about her life in Easkey and her time spent as a midwife in the area. She came to the village of Easkey in 1944 from Skreen, just up the road. She had spent some time in England but decided to come home. “I had spent some time in England. I was sent home on holiday for six months and when I was home, this job [being a midwife] came up. It was originally for four months and it went on for four years as a temporary thing and they eventually made me permanent and from there I was here working for 40 years,” she said. Working as a midwife back then was hard work. Bea would have to go on her bicycle to make house calls in treacherous conditions and bad roads. Shortly after being made permanent in her position, Bea got a car which was a great help as the area was becoming busier. “I was getting busier and busier. I had about 60 deliveries for two years. Over time that number came down. More people were going to the hospital and having their babies delivered by other means,” she said. Bea’s sister was also a midwife and during a period where Bea was off from work, her sister filled in for her. “I got my sister to fill in for me out here and she said at the time ‘If I was getting £1,000 a day I wouldn’t do this job!’”, she said. A lot of the time houses may not have had running water or electricity. Much of Bea’s work was done in poor lamp light or even in candle light. “They had nothing. It was a tough time but I had some of the equipment I needed to do it,” she said. By the seventies most babies were delivered in hospitals and the local midwifery profession was in decline. Bea however was always kept going. The Dunphy family in Easkey would be a well known farming family. In 1949 she married Joe Dunphy from Easkey with whom she had five children. Joe, who passed away in 1996, was involved in the IFA as North West Chairman and during the famous 1966 protests outside the Dáíl, Joe and Bea both did their stint outside government buildings to help get a better financial situation for farmers across the country. “Joe was very involved in the IFA and walked to Dublin in 1966. We [the wives] had to do our turn as well. Sitting in Merrian Square. Charlie Haughey wouldn’t meet them [the farmers]. There was 3,000 people that walked to Dublin that time. The men sat on the chairs outside the Dáíl for nine nights and nine days,” she said. Of the nine men sitting outside the Dáíl in protest, Joe was one of them. The wives came up so that the men could go and attend IFA meetings and thus Bea and her comrades took over from their spouses. In an interesting side note, it is perhaps timely that Bea’s birthday would also happen to fall in the vicinity of the 50th anniversary of the march by the farmers to the Dáíl in 1966. Aside from the midwifery, farming and the raising of their children, Bea and her husband Joe were also involved in the local area through community initiatives through the Easkey Development Association which was set up in the late 1960s and of which Bea was a secretary. After living such an active life for so long, the typical day now is somewhat slower than it once was for Bea, however she still remains active. She is proud of her ever growing family which consists of her five children, nine grandchildren and one great grandchild. “All in all they are all coming on,” she said.